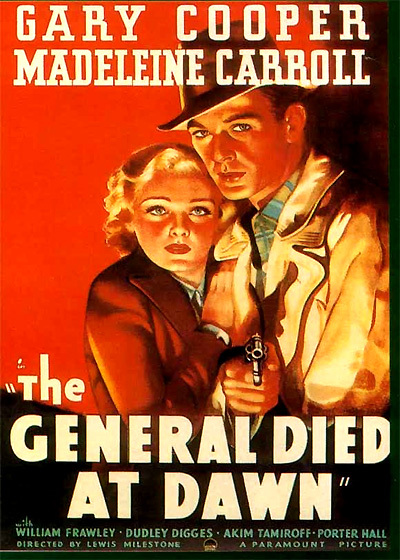 The General Died at Dawn (1936) is an adventure film set in the northern Chinese provinces that are torn by civil war, unrest, and revolution. The film is famous for Gary Cooper's line to Madeleine Carroll, "We could make beautiful music together." An American mercenary and reporter O'Hara (Gary Cooper) is on a dangerous mission to help supply arms to the authorities to aid the peasants in a province ravaged by lunatic ambitious warlord General Yang (Akim Tamiroff). On the train to Shanghai, he meets and falls in love with Judy Perrie (Madeleine Carroll), whose shady and weak father Peter (Porter Hall) is in league with Yang and pressures unwilling Judy to luringly betray O'Hara. "We could have made wonderful music together." "He was a talented man but very, very corrupt."